Budget day, today. Since all measures will be revealed later this afternoon there is little sense in going through what should be. Let’s just throw a few facts into the debate for there are plenty of assumptions, assertions and ‘in passing’ comments that pretend to be self-evident truths. While the following is a bit number-wonk we can take this as just one example of the unfortunate state of the debate over the economy. 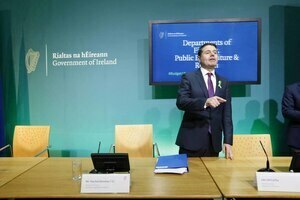 In particular, it has been stated on a number of occasions that day-to-day current spending (health, education, social protection) is rising ‘too quickly’ and that the improvement in our public finances is ‘slowing-down’. The evidence, however, is weak. Since 2014, when current spending reached an austerity low, it has been increasing. But is it rising faster than the European norm? his is particularly modest when one considers that Irish current spending fell by over six percent during the austerity years while Eurozone spending grew by nearly seven percent. The fact is that current spending is not growing ‘fast’ – not in comparison with other Eurozone countries. There is a claim that our progress on reducing the debt and the deficit is sluggish. Let’s look at debt figures. Since 2013 (when Irish debt was its highest) Eurozone debt has fallen by 9.8 percentage points when measured as a percentage of GDP; Irish debt has fallen by 53.1 percentage points when measured as a percentage of GNI*. Of course, Irish debt was extremely high in 2013. But on any reckoning, this has been an incredible achievement. Even looking at short-term period – the projected debt between 2017 and 2019 – Irish debt will fall by 6.9 percentage points; the Eurozone will only fall by 4.7 percentage points. Our debt is falling faster than all other Eurozone countries. We still have a long ways to go to bring it to Eurozone levels but we are heading in the right direction. Remember those double digit deficit figures when the recession hit? By next year we will have effectively balanced the budget. Indeed, we will have a significant current budget surplus – meaning that we are raising considerably more revenue than we are spending on day-to-day budget. And we are doing better than the Eurozone average. 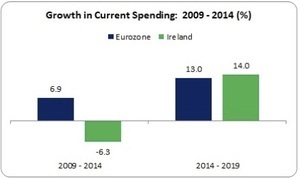 Next year, Ireland will have a 0.2 percent deficit (measured against GNI*); the Eurozone deficit will be 0.6 percent. This may seem small griefs but this is the type of debate we have – assertions and assumptions that prepare the ground for a restrictive fiscal stance regardless of the context or even the fiscal rules. This is compounded by a general media commentary (with some exceptions) which accepts these assertions uncritically. The best example of this is the Government’s claim that it has only €800 million to spend before discretionary measures (i.e. before tax increases); actually, it is €1.7 billion but you wouldn’t know that by that following public debate. Ironically, to get the actual state of affairs you need to read the Government’s own statements. Should there be a restrictive budget? A surplus? An increasing emphasis on reducing the debt (and the manner in which you do that)? These are all legitimate areas for debate. Unfortunately, we don’t get that debate. We get hollow arguments and unsubstantiated claims which only degrade economic discourse and close off alternative options. Just like the debate over austerity. 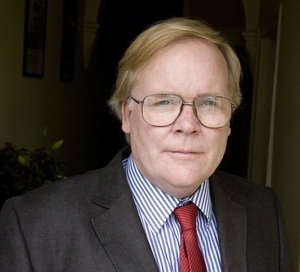 Michael Taft is a researcher for SIPTU and author of the political economy blog, Notes on the Front. Posted in Misc and tagged Michael Taft, taft on tuesday at 9:27 am on October 9, 2018 by Michael Taft. Those graphs don’t look right. I think that the labels are the wrong way around. Sorry Jibjob, fixed now. Thank you. bar chart seems to have the years the wrong way around? Thanks Owen C, fixed now. Sorry. in 2013 the General Government Debt was €215bn; (but €24bn of that was cash). By 2017 the General Government Debt had ‘dropped’ to €201; (but now we have ‘only’ €13bn in cash). The real debt (excluding cash) has fallen from 191 to 181 – less than 2%. Yes the economy has bounced, and this makes our debt:GDP ratios look great. But we still owe almost 200bn – that isn’t moving. The real debt (excluding cash) has fallen from €191bn to €188bn – (€3.6bn) or less than 2%. I’m reasonably relaxed on the high level issue of nominal vs relative debt. The bigger issue is how useful is GDP as the benchmark and how low does it need to go in proportional terms (GDP or GNI*) to allow a large enough buffer for the next economic shock. If there is a need to get debt/GDP down to, say, 40-50%, then we’ve still a long way to go despite the next few years likely being less benign in economic terms than the last five years. So there is an argument, that I don’t necessarily agree with but which i wouldn’t just ignore, that we should be running surpluses now (although the low interest rate environment and terming out of cheap debt makes this less of an issue than would otherwise be the case).